THE SORCEROR'S APPRENTICE: MARCH OF THE BROOMS - Boston Crusaders Drum & Bugle Corps. Basically on my trail, here are the challenges so far: House Sparrows (not protected); House Wrens (protected), Blowflies, Black Rat Snakes (A snake got to chicks from one box. A very large enough rat snake can stand on end and bypass the stovepipe baffle). I’ve worked with problems relating to paper wasps, mud dauber wasps, hornets (once!) buffalo gnats, mice, flying squirrels, competition issues with house wrens and chickadees, snakes, spider webs, ants, and curious humans attempting to open the boxes. 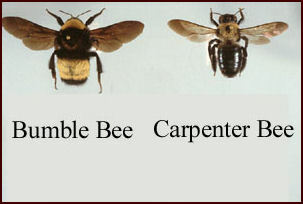 CARPENTER BEES: I came across a new problem in June 2011 in one of my nestboxes. As I was approaching the box to monitor it, I heard a faint buzzing noise. I have been stung by a Yellow Jacket on my trail in past, so I backed away looking for anything relating to a bee or bees or wasps flying around the nestbox. I saw nothing but continued to hear the buzzing. So I approached the box slowly and then figured it out. The buzzing was underneath the box, and I watched for about a minute a carpenter bee spinning around boring a hole on the underside and outside the nestbox–he had no interest I was even there watching him at all. I had never seen this before on my trail. I did not have my camera ready, but I did deter that bee from continuing, as his bored hole wasn’t deep enough to go through the floor. I had some HotShot flying insect killer in my car (which I never use inside a nestbox), and I had a Q-Tip in my purse. I sprayed the Q-Tip with the HotShot soaking the cotton tip. I approached the spinning bee and waved the Q-Tip around him. He flew off the box and circled rather confused; at the same time, I walked FAST back to my car, closed the windows, and sat there for a few minutes writing in my notebook. I then went back to the box, found the bee had left, and then I took that same Q-Tip and swabbed it inside the hole, soaking inside the bored wood where the hole was a slightly on the outside edges of it. I left to monitor another nestbox. When I came back to the box a few days later, no bee, no deepened bored hole–problem easily solved, thankfully. I never saw a carpenter bee again on that nestbox. 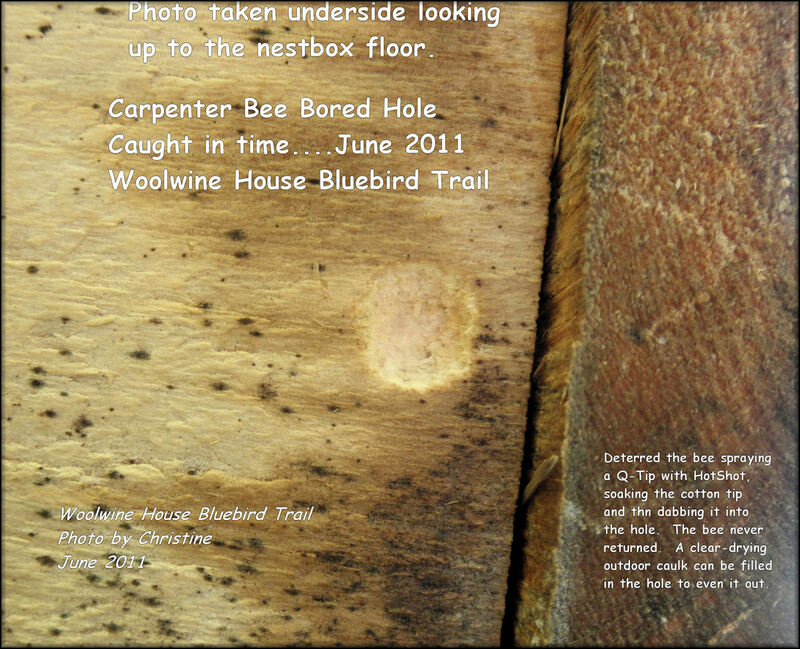 Below is the photo I took on my return visit to the box a few days later of that bored hole, and a picture-drawing of a carpenter bee compared to a bumble bee. Vapo-Rub!) has been recommended to me by the VBS at the base of the pole and also underneath the stovepipe on the pole to keep climbing predators, like ants, from getting to the box. This should never be appled near the box itself to keep the birds safe from substances on the pole. 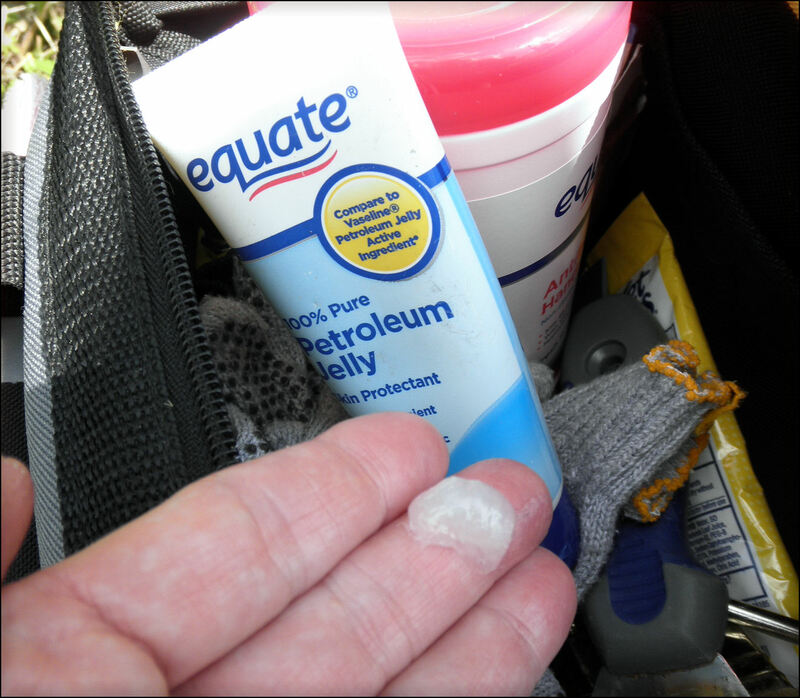 I was able to find a cheap container of the non-fragranced petroleum jelly–generic brand–to do this job. DO NOT APPLY AT BASE of the pole or on the pole itself, EXCEPT underneath the baffles. Plain, cheap, non-fragranced petroleum jelly (no menthol) is great to keep crawlings insects getting up to a nestbox. Do not use Tanglefoot–it’s dangerous to other wildlife that can rub up against that product. Yes, I monitor my trail AT LEAST once a week….sometimes 2 to 3 times a week if I’m having issues. Because of the problems bluebirds have in nesting, it is why we monitors step in as human intervention…to help them be successful and survive. Because of man-made nestboxes and human monitoring, the bluebirds have come back in North America in the past decade. What happens in the woods in natural cavities is not up to us. All we can do is hope they have at least a 50% survival rate. In Virginia, we have only Eastern Bluebirds. Eastern Bluebirds are the most common in the United States. The Mountain and Western Bluebirds are larger than the Eastern Bluebird. They require a larger entry hole in nestboxes. Monitoring a trail takes work and dedication….it’s all weather-permitting, particularly during hatchling time! The birds’ safety is Number One! No, No, No! (I found this picture on the Virginia Bluebird Society’s website). I took this photo of Box 7 on 6-9-09. It is just stuffed to the brim, out the hole with sticks…no nesting at all in this box. I removed the sticks, allowing another cavity nester to nest here. Blowfly larvae, black rat snakes, paper wasps, spiders and webs inside boxes, ants, bad weather (too much rain)….all seem to be the biggest problems on my trail for 2009. My biggest loss is 5-day old chicks, not feathered well due to blowfly larvae, but nevertheless saved by a nest switchout by me with antoher clean needle nest, have been succumbed to a rat snake the following day. I use the predator guard to ward off snakes, but this snake was too large and was able to get by the guard this box. The chicks were 10 days old. Other boxes close to town have had some House Sparrow and House Wren territorial issues, as I had noted above. Here are two photos of blowfly larvae and nest material (below). Not the most pleasant photos to post, unfortunately; but it’s educational to many who have no idea how nature works sometimes and howewe bluebirders deal with it. If you want more info on blowfly issues on your own trail or in y our back yard nestbox, I find, again, www.Sialis.org the best source, and go to the Index and look under Blowflies. This photo was borrowed from Harry Schmeider’s beautiful bluebird website titled, “Ambassador for the Bluebirds” under the Blowfly page. 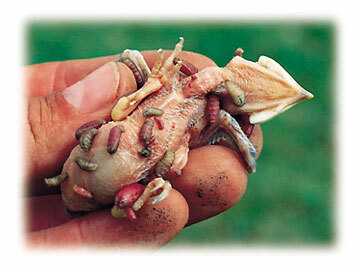 This represents what an “infestation” will do to a young nestling. If you can, do all you can to stop this from happening to your native cavity nesters. This is NOT pretty. This is the part of bluebirding that’s not so fun, but we want to help as best as we can. This is what is shaken out of an infested nest. Note all the dust and broken pine needles and the number of larvae. Ugh! You get the idea here. Dropped from a nest of 9-day old bluebird chicks. The past two years of bluebirding for me, I’ve seen the blowflies. The first two years of bluebirding for me was during a drought; thus, no blowfly problems. High heat accompanied the drought, however, another problem for nesting birds if not enough ventilation is allowed and provided for nestboxes or the box is in the afternoon soon during the hottest part of the day. This is one of the two species of wasps I have to deal with on my trail. This is the mud dauber built mud tunnel nests. The other species of wasp I have is the Paper Wasp. Paper wasps are not aggressive and easier to deal with. I make an ivory-soap paste and a pastry brush to paint the inside of my boxes to deter wasps building in my boxes! Most of the time, it works! I have to be diligent about it. The mud tunnels are actually rather pretty, when you think about. Nature is amazing–such artwork! We cannot let wasps build nests inside our nestboxes! BELOW: THE USAGE OF ARTIFICIAL NESTCUPS…. I LIKE THEM, BUT THE JURY IS STILL OUT IF THEY ARE BETTER FOR THE BIRDS OR NOT….MORE ON THIS TOPIC SOON. I experiment using these artificial nestcups on my trail. There are pros and cons to using them. I think it’s better for the birds not to use them in my particular boxes. They can be problematic. More on this topic soon on this page. I like them for some reasons for my purposes; for the birds’ purposes, I am not absolutely sure.This is one of the two species of wasps I have to deal with on my trail. This is the mud dauber built mud tunnel nests. The other species of wasp I have is the Paper Wasp. Paper wasps are not aggresive and easier to deal with. I make an ivory-soap paste and a pastry brush to paint the inside of my boxes to deter wasps building in my boxes! Most of the time, it works! I have to be diligent about it. WEATHER CAN CAUSE PROBLEMS, like this ice storm for winterizing adult bluebirds on our property. 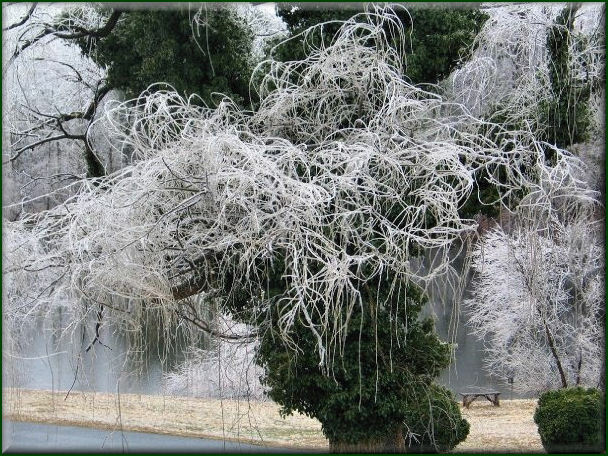 I took this photo during the big ice storm of 2008. This is where the mealworms come in handy for adult birds in the winter that can’t get food or during early Spring during first hatchlings during cold snaps! I also like using mealworm feeders sometimes, not year-round, so that I can get good photos of the birds.